Junior Reid is a worldwide Reggae/Dancehall legend. The former lead singer of Black Uhuru, with chart topping hits including the monster hits One Blood and This is Why I’m Hot, is to be touring North America with his sons, Andrew and Wada Blood in March 2010. His new release, The Real O.G. video, just went out on the net in late October on www.worldstarhiphop.com and it has already gotten over seven million hits in three days. The Real O.G. video was produced by Jordan Tower Films in Hollywood CA, and the song itself was produced by Blackout Movements and JR records. Prior to the tour, Leak Records, JR Records, ABB Records and Koch distribution are releasing Junior’s much-anticipated new CD – Junior Reid, The Living Legend. This CD features hot current hip-hop artists such as Snoop Dog, Lil Wayn, Cool and Dre and Swiss Beat and the reggae artists Capleton and Andrew and Wada Blood, Junior’s sons. In support of this new CD, Junior and his sons are hitting the road again, touring hard worldwide. Earlier in the year, Hustle Til the Day I Die, by Junior’s sons Andrew and Wada Blood, produced by Firelinks, created their own waves in the popular Jamaican dance halls. Many people connected with this song. Hustle till the Day I Die received rave reviews, and successfully soared to number two on the Jamaican charts. After charting their way with Hustle Til the Day I Die, the Young Bloods released another follow up single and video called La La La, that went to #1 on the Jamaican charts and soon thereafter came out on the VP Hits Compilation. Andrew and Wada Blood have many more hit tracks including It’s My Time and Rasta Empire. The music video for the single It’s My Time is loved and requested in Jamaica and all over the world. 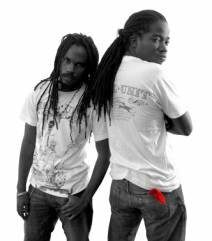 Andrew and Wada Blood are currently performing on all the major festivals in Jamaica. They have made their own stamp within the music fraternity. Look out for their new album, coming soon. June 2009, Junior kept the successful annual Junior Reid birthday bash at Sugarman Beach in Saint Catherine, Jamaica. He also has a new club in Kingston called The View on the Spot, which is currently one of the most popular gathering places in Kingston. 2007, Junior Reid won three music awards in Jamaica. November 2007, he was featured on the American Music Awards with Alicia Keys on prime time American television. One Blood was sampled by The Game for It’s Okay, and features Junior on the #1 hit off of The Game’s latest album. Junior is also featured on MMS remix to the chart topping single This is Why I’m Hot. This single was a number one song on the radio and in the clubs, and the video was on heavy rotation on BET. He also featured on a Fabulous track his song Real Gangster Don’t Play. July/ August 2008, alongside the Reggae Angels, Junior Reid toured the Western U.S., culminating in top billing backed by Sly and Robbie on the Reggae Rising festival in Humboldt, CA. August 2008, Junior Reid and the Reggae Angels toured Europe, doing most of the major summer festivals in many European countries. Junior returned to the US to headline the Monterey Bay Reggaefest the end of August. October, Junior toured the northwestern U.S. and in 2009 he was a top billing artist on The Sierra Nevada World Music Festival. Junior’s live show is in top shape with a repertoire of hit after hit songs. His sons Andrew and Wada Blood are also hot, up front and in their element wherever they are worldwide. Junior’s One Blood band is clicking and well worked in. Junior Reid, Andrew Blood and Wada Blood are definitely ready for action. district of West Kingston. Junior began his career at an early age, gaining his initial inspiration from a tough upbringing. He recorded his first single, Speak the Truth at age fourteen for the late singer Hugh Mundell. His second release, Know Myself was released in the UK on the flip side of the Hugh Mundell 12 inch, Can’t Pop No Style, on the Greensleeves label. He then went on to form his own band, The Voice of Progress, and after a local hit with Minibus Driver, the group’s success was established with the album of the same name. Once again a solo artist, Junior recorded a number of songs for J.R. Productions and Sugar Minott’s Youth Promotion label, enjoying considerable popularity with tracks such as Human Nature, A-1 Lover, Uplifting and Proud Statement. 1988 saw the release of Junior’s first solo album, One Blood. The One Blood single was remixed by Paul "Trouble" Anderson and released worldwide on Big Life/Mercury Records. That track and Long Road received nominations for the prestigious Caribbean Music Awards and the Jamaica Music Industry Awards. He won awards for Best Album, Best Single, Best Song and Most Conscious Lyrics at the Jamaica Music Industry Awards. The follow-up to One Blood was the album Visa, which was distributed by the Greensleeves and Ras labels in addition to his J.R. Productions label. and newspapers and performed extensively internationally. In a producing role, Junior has lent his talents to various other artists. Early on, he worked with Dennis Brown, Gregory Isaacs and the Mighty Diamonds to name few. More recently, he has produced Andrew & ‘Wada Blood (his sons), Elephant Man, Delly Ranks, Luciano and Anthony B. Reid has worked closely with Rap artists such as Wu Tang Clan, Goroo from Gangstar, the Absolute Beginners (from Germany) and Cold Cut. In the year 2000 Mr. Reid/J.R. Productions distributed the Emanuel Calling album, featuring the songs Mashing Up the Earth, John Law and Trod Up A-Zion. He toured the United States and Caribbean, garnering raves. In 2002 Rasta Government was released. Lost Vinyl Classics was released in 2005. This compilation of singles has sold exceptionally well. The cover artwork is a classic. Junior’s new album Junior Reid, the Living Legend is scheduled to be released in November 2009. Following in their father Junior Reid’s footsteps, Wada and Andrew Blood have chosen a career path of music. The two have been heavily influenced by their father, Junior "One Blood" Reid, but have an extremely different style from him. Their music is described as a cross between hip-hop, dancehall and reggae ballad, which gives the young Bloods their uniqueness. Andrew and Wada are two exceptional and unique Jamaican artists. Their songwriting skills have also placed them as outstanding and promising talents for current and future generations. They are among the most idiosyncratic personalities in the music industry, as they are not only reggae and dancehall artists, but also producers and studio engineers who create their own styles and beats that they put their lyrics to. Most of their lyrics or ideas for their music are based on everyday-happenings, which come from snippets of conversations and images. The beats that they create soar above everything else, rather than blending in to the singing. The beats are simple but different with special effects. They learnt this trade from hanging around the studio on weekends as teenagers while listening to their dad voice tunes. Having learnt this trade early in life, they have now blossomed into the fine artists and producers they are today. They have produced songs for a number of prominent artists including their father, and are signed to the label JR Productions. The World -Quake rhythm is the latest addition to their belts. This rhythm is produced and created by both Andrew and Wada. Artists such as Junior “One Blood” Reid, Elephant Man, Munga, and Gyptian have been featured on the rhythm. These two remarkable young artists have toured and performed triumphantly in places such as Japan, Trinidad & Tobago, Bahamas, Barbados, Europe, California, Belize, Mexico and North America, and have appeared before an audience of approximately 20,000 patrons. In fact, they have been performing since they were youngsters. Jamaicans would refer to this as "from dem eyes deh at dem knees". Their earliest performances were at Reggae Sun Splash and they have continued to perform locally at shows, such as, Sting, Rebel Salute, Jam Jam, and East fest, and internationally at shows, such as Reggae on the River. Some of the songs that they have both written and co-produced are; "One stick a matches", "Watch over me", Gal Hafi BAL", "Drop It Pon Dem", and "Want Tek Life", a collaboration with their father. The budding stars continue to blend hip-hop with dancehall, and this is highlighted in their exciting single, "Hustle Til the Day I Die". "Hustle Til the Day I Die", which was produced by Firelinks, created waves on the popular dance scenes –Bembe, Hot Mondays, and Early Mondays. Soon after the song hit the charts the duo dedicated the song to all hustlers, claiming that Jamaicans were the greatest and most successful hustlers. Many people connected with the song and even volunteered to appear in the video in support of the message it carried across. "Hustle till the day I die" received incredible reviews, and successfully soared to number seven on the charts. In May of 2008 Andrew and Wada Blood gave a stunning performance at the Heineken Green Synergy Party, which was held in the British Virgin Island of St. Thomas. They had young girls screaming and begging for more. After charting their way with “Hustle Til the Day I Die”, the Young Bloods released another single, “It’s my time”. The music video for this single was considered controversial to some extent, by some of corporate Jamaica. Despite all of this, the request for airplay was phenomenal. Prominent dancers on the dance scenes put together a dance that they believed was quite suitable and befitting. The Bloods are guided by the philosophy to “ make hay while the sun shines”, so they are constantly in the studio working on a variety of music. After releasing “It’s my Time”, Soon, fans danced to and voted “Hustler for life” to number one on the music charts. This single was accompanied by a striking video, which was directed by the Bloods themselves. “Hustler for life” was done on the Galis rhythm. In 2009 following the release of “Hustler for life”a number of songs were released – Mr. Rip-off, Money Print, Money Ova Gunshot, A weh dem feel like featuring Munga, "na go make" on the beach front riddim and "naa do it"on the giant riddim. In the summer period Andrew and Wada as shown that ITS THERE TIME, with an outstanding performance at "A St Mary We Come From", "Champion In Action" and "Beeni Sizzle". Andrew and Wada want to be classified with some of Reggae’s greats and Dance Hall giants. According to the duo, "music is life" and the positive vibrations that generate from the music can work wonders, and that is why their mission is to create lifelong music. This young group is dynamic, versatile, and is on their way to making their mark in this exciting music industry. Who is to stop them now? Clearly, they are on their way to the top, no looking back, after all, a real hustler knows how to get there. "Keep the energy flowing through the music, one beat, and spread pure positive vibration"